I have frequently discussed, examined, and otherwise elaborated on composer Christopher Young’s long and illustrious career and, more recently, his tremendous and variant film scores of 2009. If you don’t believe me, take a look here, here, here, here, or even here. Though Young began his career in horror – and still makes an impressive showing there now and again (see Drag Me To Hell for very recent proof) – he seems to take pleasure in stepping outside of his familiar zone and working in all varieties of genres. As his jaunty score for the romantic comedy/drama Love Happens shows, he’s more than capable of working in whichever genre he pleases. Starring Jennifer Aniston and Aaron Eckhart, Love Happens tells the (slightly cheesy) story of a self-help guru who “unexpectedly meets the one person who might finally be able to help him help himself.” Using a solid orchestral background, Young creates a collection of music that roots itself in a comfortably playful yet slightly melancholic thematic structure. Mostly the piano leads the way, providing the oft-repeating Love Happens theme throughout the album. There’s a nice progression through the album, as the score starts off playful with teasingly happy tracks like, “It’s MMM…Good” and then slowly transitions into slightly more emotional material (some of Young’s signature horror/thriller stylings even come through on tracks such as the dark “Mind Noise,” a track where Young makes great use of atmosphere and tension). By the end of the album, as a listener you’ll have been through the romantic comedy ringer of love, loss, and refound love. The jangly “Why the Hell Am I in Heaven?” is the jumpiest and most interesting track on the album, but it still manages to fit in nicely with everything else. Once again Christopher Young has created a feature film score that stands on its own as enjoyable music. Whether you want to watch the Aniston/Eckhart antics that accompany this music, it’s a collection worth checking out. 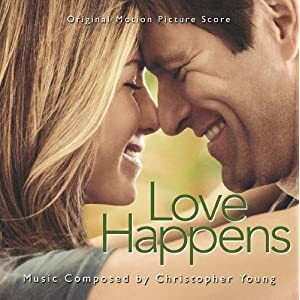 No user commented in " Music Review: Love Happens Original Motion Picture Score, by Christopher Young "